Valley Friends Meeting is working toward achieving a Carbon Free Meetinghouse. Members and attenders at Valley Friends Meeting celebrate the installation of solar panels on the Meeting House. December 2018. 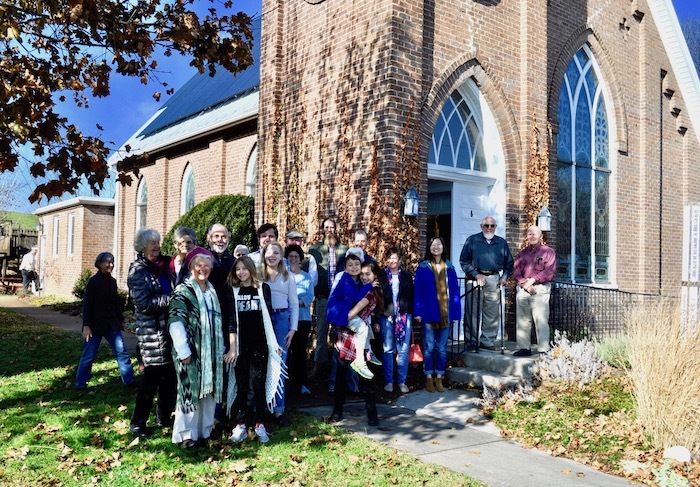 On November 14, 2018, Valley Friends (Quaker) Meeting (VFM) in Dayton, Virginia, attained its goal of a (nearly) net-zero carbon footprint. Quakers are nothing if not deliberate, and this milestone marked the culmination of a five-year, multi-phase process. VFM’s process began in April 2014 when several members, concerned about climate change, organized a small committee to study the issue. In August 2014, the committee issued a “Minute (Statement) on Climate Change,” which was approved by the Meeting and published as a call to action in Harrisonburg’s Daily News-Record. Recognizing the need to “practice what we preach,” VFM established a second committee to quantify the meetinghouse’s energy needs and recommend carbon-reduction options. This assessment revealed a tantalizing possibility—net-zero emissions (exclusive of transportation)—by replacing an antiquated oil furnace with a modern heat pump followed by installing a solar array on the south-facing roof sufficient for all electrical needs, including heating. Although initial cost estimates far exceeded VFM’s modest finances, the Meeting charged the committee to seek “way forward.” Following a year of internal and external fundraising, and a competitive best-value bid, a vendor was selected to install a high-efficiency-heat pump. This phase was completed in December 2016, making the meetinghouse fully electric. How then to finance the next phase, a solar array? The process foundered for a year until power-purchase agreements (PPA’s) became available in our locale in January 2017. A second competitive bid produced a solar installer and PPA provider. Sometimes the right thing and the smart thing coincide. VFM is saving more than $1,000 annually in utility costs. From these savings we’ve been able to pay forward some of the community support we received by contributing to a local solarization initiative: Give.Solar. Win, win, win. Can We Help You Reduce Your Carbon Footprint? With hindsight comes clarity. Perhaps our experience can benefit other faith-based organizations or non-profits in their carbon-reduction efforts. Feel free to contact Dave Pruett at c.david.pruett@gmail.com or (540-246-3087, leave message). Valley Friends Meeting is serious about climate change. Read our published climate change minute. Join us for Quaker Meeting for Worship at 10am each Sunday. Ask a question or say “Hello”! Just send a message to hello@valleyfriends.org.